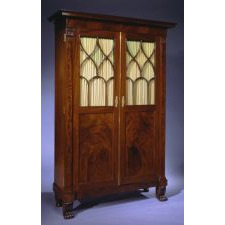 The flat oblong pediment top over a tall case having a pair of paneled cabinet doors with glazed arched and Gothic tracery windows in the top half flanked by pilasters with acanthus carved capitals, opening to a bookcase with four adjustable shelves bisected by a fall front secretary section with stacked short drawers with original stamped brass pulls flanking the fall front writing surface, all resting on a base raised on acanthus carved animal paw feet and turned legs in back. This form has no known counterparts in American classical furniture. The form is seen in plate 732 of Pierre de La Mésangère's Collection des Meubles et Objets de Goût (Paris, 1832-1834) and M. Paul Cornu’s reprint of a selection of Mésangère's plates, Meubles et Objets de Goût (Paris, 1900), pl. 109, where it is described as a Bibliothèque. This design, in the Restauration taste, must be predicated on an unpublished model at least fifteen years older, as the present example clearly pre-dates the Mésangère drawing. It is not clear from the drawing if the design incorporates the secretary interior incorporated into the present piece. Mésangère's plates were published serially from 1802 to 1835, a few plates at a time, in cahiers or albums as a supplement to the Journal des Dames et de Modes. These designs, already in production in France, heavily influenced both English and American designers. 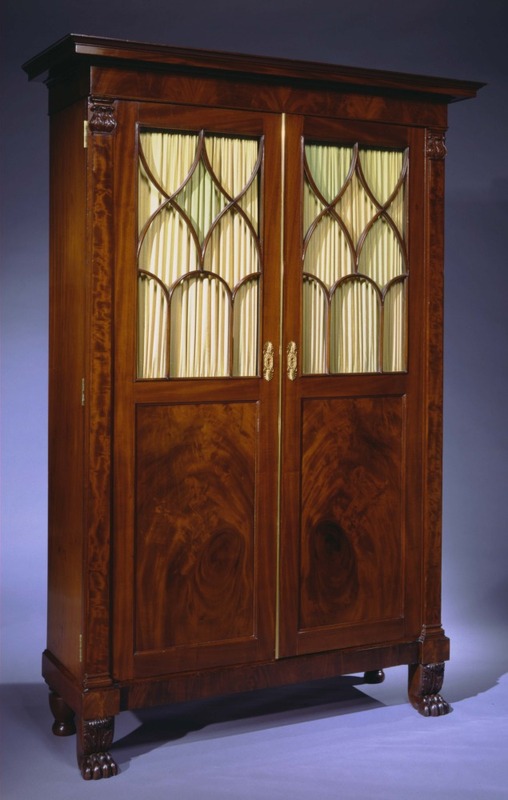 Related cabinet bookcases do not seem to appear in English pattern books of the period.